EBA airbrush tattoo stencils are offered with your choice of LamTac self adhesive stencils or Premium reusable stencils. EBA airbrush body stencils can be ordered individually or with corresponding display: Banner, Poster and Group. To find out more about LamTac and Premium airbrush tattoo stencils, contact us for more information. 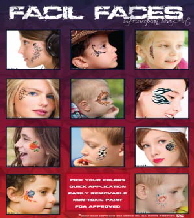 Airbrush face painting stencils by European Body Art assist face painters in creating professional looking artwork in a fraction of the time. 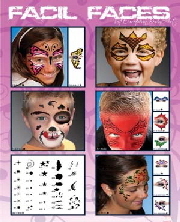 Airbrushing Faces, will offer a wide variety of popular airbrush face painting stencils for kids and adults, making sure that no one is left behind. Do you require a Custom Stencil - we can have one made for you - call for pricing.